How is it that in America the image of Jesus Christ has been used both to justify the atrocities of white supremacy and to inspire the righteousness of civil rights crusades? 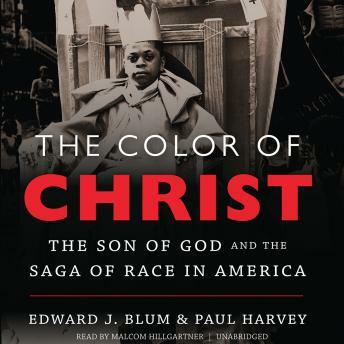 In The Color of Christ, Edward J. Blum and Paul Harvey weave a tapestry of American dreams and visions-from witch hunts to web pages, Harlem to Hollywood, slave cabins to South Park, Mormon revelations to Indian reservations-to show how Americans visually remade the Son of God time and again into a sacred symbol of their greatest aspirations, deepest terrors, and mightiest strivings for racial power and justice. The Color of Christ uncovers how, in a country founded by Puritans who destroyed depictions of Jesus, Americans came to believe in the whiteness of Christ. Some envisioned a white Christ who would sanctify the exploitation of Native Americans and African Americans and bless imperial expansion. Many others pictured a messiah, not necessarily white, who was willing and able to confront white supremacy. The color of Christ still symbolizes America's most combustible divisions, revealing the power and malleability of race and religion from colonial times to the presidency of Barack Obama. This book was very good and educational. Somewhat repetitive but I would recommend it. Really makes you think!